What comes to your mind when you think of God and His Christ? What false perceptions of God have you developed in your life-time? Every word of Scripture is a megaphone of warning to the believer, for as a man thinks in his heart, so is he. Yet many ignore the words of wisdom that pepper the pages of the Holy Bible. Secular man has borrowed from their pages and produced many great ideals. Philosophy and psychology have twisted truths to support their own pet teaching. Science and medicine have borrowed facts and a library of tomes have resulted. But unsaved man knows nothing of God’s wisdom, as it is spiritually perceived. Natural man.. the unsaved man, knows nothing of God’s wisdom – for God’s wisdom is spiritually discerned. Natural man knows little of God’s character – and the church mirrors their progress. The Church often shadows the trail of the natural – and discovers half-truths. But right thinking about God and the Son of His love is critical to spiritual growth, for every thought we have of God, influences the decisions we make. Think about the following.. No nation in the history of the world has risen above their perception of God. No civilisation has peaked above their consciousness of Who God is. No peoples have exceeded their religious thinking of the nature of God. But like many peoples, civilisations and nations this is how some people think, and many believers have fed on inaccurate and flawed thoughts of God – and many believers remain bound to the chains of religion, built up in their youth.. and many don’t even realise this. A low and debased view of God has infiltrated the secular and Christian world. A perception of God has built up in Christendom that does not truly reflect Him, and today a low view of God and of His Christ is almost universally embraced – and a new ‘philosophy’ of God has developed: a philosophy that is far from the Truth, the Way and the Life. Collectively and individually we’ve lost our religious awe and consciousness of God. Collectively and individually we have left our first love. 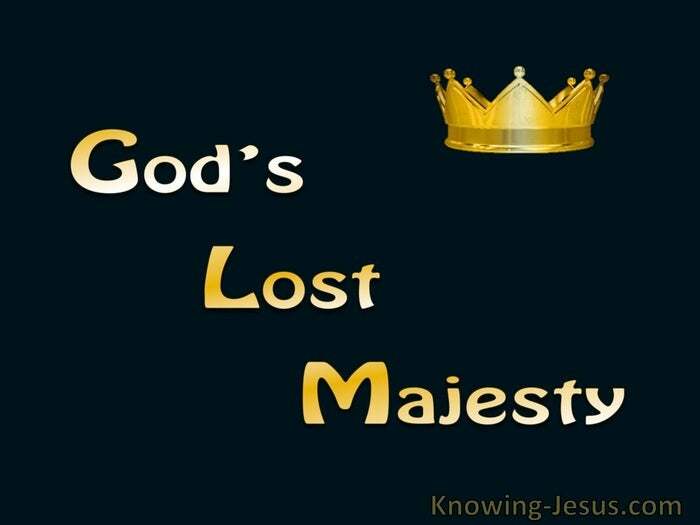 The sense of His glory, majesty and divine presence has all but evaporated. The awe-inspiring magnificence of His wisdom and power has seeped away. The spirit of worship and reverence of a supernatural Trinity has all but vanished. Amid the cut-throat realms of a satanically-seduced, sin-sick world – “God is ‘dead’” or God has lost the plot.. or God’s doesn’t care – and God’s character is misaligned. There is little time or incentive to be still and know the God of the universe.. and there are fewer who desire to fall in love with the lover of our soul. – and to worship as His feet in grateful thanks and reverential tears. There is a decline in the knowledge and understanding of the Holy One of Israel.. dwindling of honour of Him Who made us and redeemed us for time and eternity.. a misunderstanding of His methods to conform us into His image and likeness – and we ‘worship’ a god of our own perception, instead of the true and living Lord. There has always been a tendency for man to conceive in His heart Who God is: for as a man thinks in his heart, so is he. His fatherhood is often debased by the experiences of an imperfect earthly father. His steadfastness is frequently disbelieved – by the betrayal of spouse or friend. His commands are repeatedly translated into the demands of an imperfect Church. His grace is often belittled; His love often spurned; His gift treated with contempt – all because.. throughout our imperfect life we’ve not discovered Who He is, or are ill-prepared to search our souls to discover the baseness in ourselves – or our biased perceptions. What does come to YOUR mind when you think of God and His Christ? Have you developed any false perception of God in your life-time? …Have I? 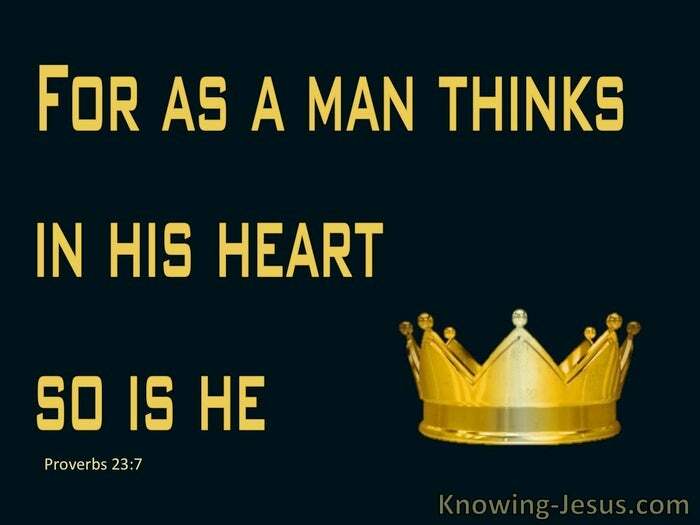 For as a man thinks in his heart, so is he. Are you prepared to humbly do anything about it. Am I humble enough to do so, as well?